The mint bush continues to thrive, even with some killing frosts in the past two weeks, which just amazes me. Supposedly the plants grow best in wet soil with partial sunlight, though this bush has grown in a south-facing garden with full sun and has far exceeded my expectations. I have to trim it frequently to keep it in check, but we’ve had so many uses for it that trimming is not a hardship. Because we want to keep some mint on hand during the winter, I’m rooting some stems in soil and some in water to see which ones root faster, then will transplant in a pot for our indoor garden. 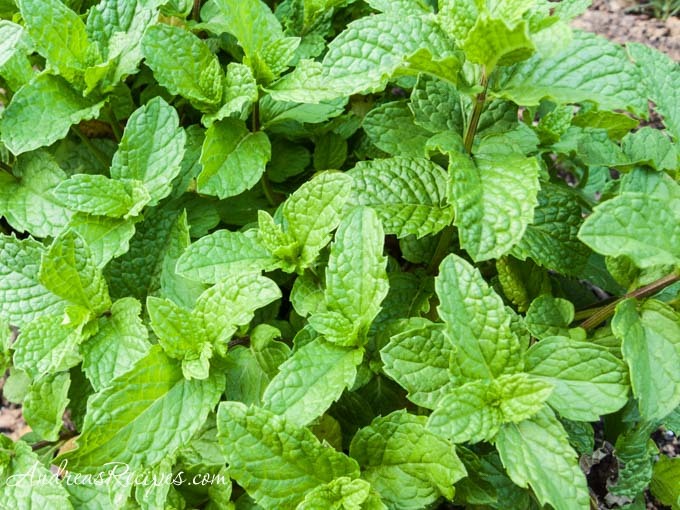 Most varieties of mint propagate easily with either method. 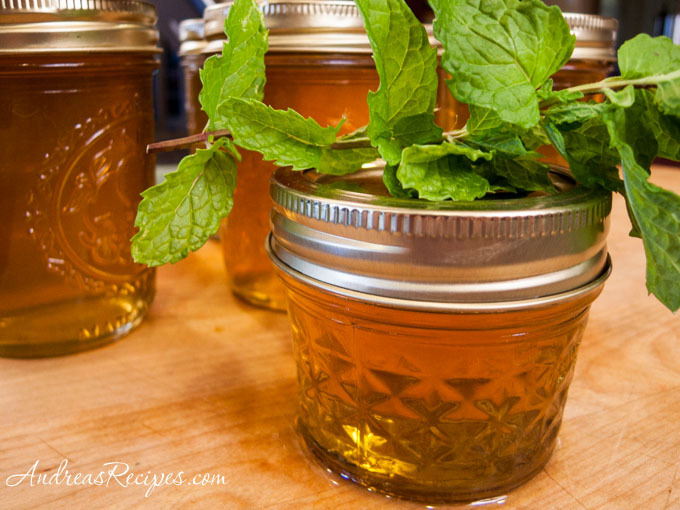 Today I sipped fresh mint tea with honey while canning the mint apple jelly. Though I like jelly made from fresh apples, I was short on time and chose a recipe that starts with apple juice. I chose a natural type that hasn’t strained all the flavor out and was rewarded with a golden amber jelly with an aroma that made me think of making apple mint tea. The mint infused the apple juice quickly and permeated the air in the kitchen. I couldn’t resist the urge to stand over the pot and take in the wonderful aroma. 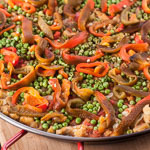 This is my contribution to the third anniversary edition of Weekend Herb Blogging, a weekly event founded by the talented Kalyn of Kalyn’s Kitchen. She has some celebration giveaways going on, so don’t forget to check those out, then visit her blog again next week for the round-up! Sterilize jars, rings, and lids according to the instructions in Home Canning (Boiling Water Method). Keep the jars in the canning pot and the lids and bands in the 3-quart pot with hot, not boiling, water. Pour the apple cider into the 6-quart pot and add the mint. Cover and bring to a boil, then turn off the heat and allow to infuse for 10 minutes. Strain out the mint leaves. Stir the pectin into the hot apple cider. Bring to a boil, then add the sugar. Bring back to a hard boil and continue for 1 minute, uncovered, stirring constantly. Skim the foam off the top of the mixture. Pour into hot jars, leaving about 1/4-inch head space, and run the plastic spatula around the inside of the jar to remove any bubbles. Add the hot lids and bands, twisting the bands just until finger tight. Process for 10 minutes covered, then remove lid and process for 5 more minute, uncovered. 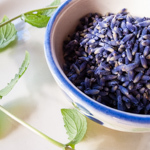 Remove jars from canning pot and sit on a cutting board or other heat resistant surface. Leave until you hear the pops, indicating the jars sealed. Store in a dark, cool place for up to one year. If any jars don't seal, store in the refrigerator and use within a week. Prep time does not include time to prepare jars and canning equipment. A Lifetime of Cooking – Crabapple and Pomegranate Jelly with Rosebuds. What a great idea for a WHB post. My mint is also still flourishing even though it’s freezing here at night. Sounds delicious; plus I’m impressed when anyone does canning! This sounds so good! I’ll have to check on my mint and see if I have enough left to try this! Hi Andrea! 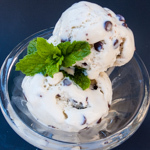 I can almost feel the mint here… beautiful recipe! Hi Andrea! I can almost smell the mint here… beautiful recipe!